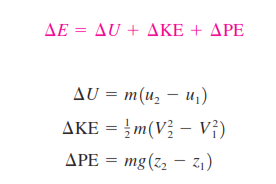 _The first law of thermodynamics, also known as the conservation of energy principle, provides a sound basis for studying the relationships among the various forms of energy and energy interactions. Based on experimental observations, the first law of thermodynamics states that energy can be neither created nor destroyed during a process; it can only change forms. Therefore, every bit of energy should be accounted for during a process. various forms of energy and recognizing the forms of energy transfer. Note that energy is a property, and the value of a property does not change unless the state of the system changes. Therefore, the energy change of a system is zero if the state of the system does not change during the process. 1. Heat Transfer, Q Heat transfer to a system (heat gain) increases the energy of the molecules and thus the internal energy of the system, and heat transfer from a system (heat loss) decreases it since the energy transferred out as heat comes from the energy of the molecules of the system. 2. Work Transfer, W An energy interaction that is not caused by a temperature difference between a system and its surroundings is work. 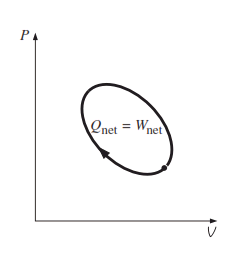 A rising piston, a rotating shaft, and an electrical wire crossing the system boundaries are all associated with work interactions. 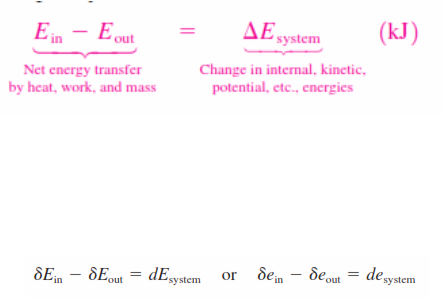 Work transfer to a system (i.e., work done on a system) increases the energy of the system, and work transfer from a system (i.e., work done by the system) decreases it since the energy transferred out as work comes from the energy contained in the system. Car engines and hydraulic, steam, or gas turbines produce work while compressors, pumps, and mixers consume work.